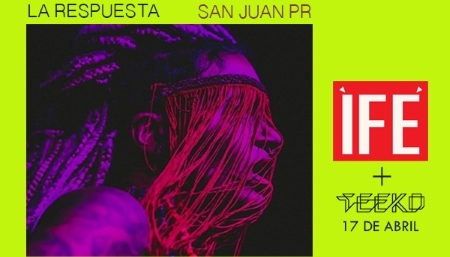 San Juan Puerto Rico's internationally acclaimed live electronic music act kicks off their Spring North American tour with this hometown date in Santurce! Founded in 2015 by Singer / Percussionist Otura Mun, ÌFÉ has established itself as one of the vanguard groups in electronic music, taking it's unique approach to live music on the road through out Europe and the Americas. This San Juan date will feature new music from the groups upcoming sophomore album alongside tunes from their now classic debut IIII+IIII. As seen on NPR's Tiny Desk, ÌFÉ mixes elements of Afro Cuban Rumba and Bata drumming with modern electronic and dance performance to make something that has ignited the imagination of audiences world wide. Opening and closing the night will be world champion DJ/Producer and longtime Otura Mun collaborator TEEKO, directly from San Francisco, CA. TEEKO, born in Puerto Rico and raised in San Francisco is a former DMC, ITF and Guitar Center Champion DJ, producing music for the likes of Mark Ronson, D'Angelo, and Q-Tip, while helping to construct a new West Coast Funk sound alongside collaborators Dam Funk, Salva, Mr Carmack, and Ruckazoid. THIS IS GOING TO BE AN EPIC NIGHT! RESERVE YOUR TICKETS NOW!